Just before my senior year of high school, my family moved across the country. I went from one of the top public schools in California to an average public school in Maryland. I enjoyed my new school, but the difference in rigor was immediately evident. Earning an ‘A’ at my old school took twice the effort, and my Advanced Placement classes were the only ones I found challenging. In some cases, I had already learned the curriculum being taught in 12th grade back when I was a sophomore. Because of my experience, I found TNTP’s new report The Opportunity Myth troubling but unsurprising. The “opportunity myth” promises that if students perform well in school—do the work and meet expectations—they will be prepared for success in life. Like the students in this report, my peers in Maryland had dreams of becoming doctors, engineers, writers, etc.—but they were also under the false impression their good grades were setting them up to make those dreams come true. 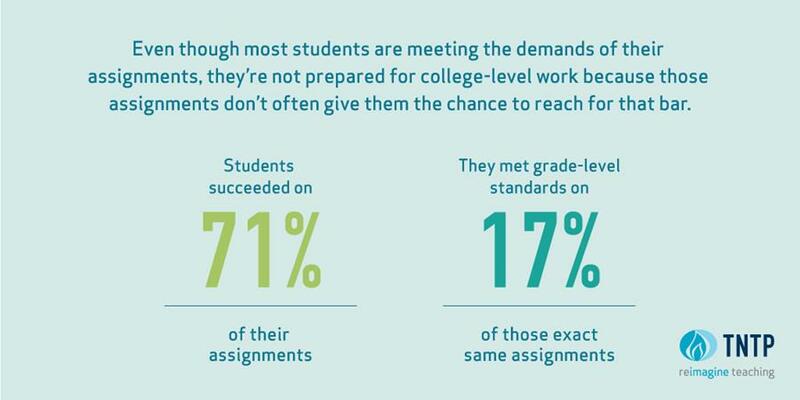 Students spend most of their time in school without access to four key resources: grade-appropriate assignments, strong instruction, deep engagement and teachers who hold high expectations. Students of color, those from low-income families, English language learners and students with mild to moderate disabilities have even less access to these resources than their peers. Greater access to the four resources can and does improve student achievement—particularly for students who start the school year behind. Success in school should be the first step on the path to success in life, however, our nation’s education systems repeatedly undermine that promise. This study is more compelling than others that have shown similar results because of its methodology. TNTP identified five diverse school districts; within these districts, the organization observed 250 teachers and reviewed thousands of assignments and assessments. In addition, TNTP collected 30,000 real-time survey responses from nearly 4,000 students regarding their perceived engagement level in school. This approach offers a different perspective and examines the reality of what is happening in the classroom. Most importantly, it gives us a closer look at the student. I encourage you to visit the interactive site OpportunityMyth.TNTP.org to see what students had to say about their goals in life and how their schools are or aren’t preparing them for the future. As the oldest of six, I encouraged my younger siblings to take Advanced Placement, International Baccalaureate and honors courses to mitigate the academic disparity in our school. But that advice won’t cut it for the 15 million public high school students across the nation. Students deserve to know that if they do well in school they can—and will—do well in life. To make this change, we can begin by accurately measuring and reporting student achievement. It is essential to have high expectations of all students, provide them grade-appropriate assignments and ensure they are deeply engaged in their school work. ExcelinEd’s policy recommendations on college and career readiness offer states information on ways to increase students’ access to Advanced Placement, International Baccalaureate, dual enrollment courses, in-demand, industry certifications and associate degrees during their K-12 school years. The choices states make today will impact the lives and opportunities of millions of students for years to come. Let’s ensure all students have the chance to prepare for the life they dream of.